“Heart failure (HF) is defined as the pathophysiological state in which an abnormality of cardiac function is responsible for the failure of the heart to pump blood at a rate commensurate with the requirements of the metabolizing tissues.” The clinical symptoms of HF include dyspnea, reduced exercise tolerance, lethargy, fatigue, ankle swelling, and edema. HF can be classified into two types, namely, acute heart failure (AHF) and chronic heart failure (CHF). Although there were significant developments in the diagnosis and treatment of HF, the disease continues to remain as one of the leading causes of re-hospitalizations, mortality, and morbidity. The disease is considered to be an epidemic condition which affects 1%–2% of the overall adult population. The prevalence rate of HF in India was estimated to be 1% of the overall population and the re-hospitalization rates have increased over the years posing a major burden on public health. The rapid economic growth has led to an increased occurrence of cardiovascular risk factors such as diabetes mellitus (DM), hypertension, obesity, and hyperlipidemia; which, in turn, results in the increased incidence of coronary artery disease (CAD) which is the most probable cause of HF. At present, the available therapies include angiotensin-converting enzyme inhibitors (ACEis), beta-adrenergic blockers, angiotensin-receptor blockers (ARBs), and aldosterone antagonists for the treatment of chronic HF with reduced ejection fraction (HFrEF). The relative risk for HF patients for re-hospitalization was eight times and the relative risk for mortality was eleven times greater among the geriatric when compared to the general population. Previous retrospective studies have also revealed that the prognosis was poor among the elderly population hospitalized for HF; hence, the treatment of the elderly population should be managed using a multidisciplinary approach involving geriatricians and cardiologists., Data on the clinical features, treatment, management, and outcomes of HF in India are sparse. Hence, we conducted a retrospective cohort analysis using the hospital records to evaluate the epidemiology of HF from a representative sample in a tertiary care teaching hospital in Tamil Nadu, South India. Furthermore, we intended to evaluate the factors which could increase the mortality risk in study participants. This was a retrospective cohort study carried out using the data from the medical records of patients who had been admitted with a diagnosis of AHF during the period from January 1, 2013 to December 31, 2017. The study was carried out after obtaining approval from the SRM Institutional Ethics Committee (1349/IEC/2018). Patients with AHF according to the 2016 European Society of Cardiology guidelines for the diagnosis and treatment of AHF and who had been admitted for the treatment and management in the past 5 years were included in the study. All the baseline demographic data, history, examination findings, laboratory investigations, echocardiographic features, clinical variables, signs and symptoms, etiology of disease, clinical presentations, cardiac clinical risk factors, and medications were obtained from the patient's hospital records. The presence of ischemic etiology was defined as patients with recent myocardial infarction (MI) or an old MI or documented coronary artery disease (CAD) as per angiography. Chronic kidney disease (CKD) was defined as abnormalities of kidney structure or function, present for >3 months or a decreased Glomerular filtration rate (GFR) <60 mL/min per 1.73 m2. Estimated glomerular filtration rate” with “estimated glomerular filtration rate (eGFR) was calculated using CKD-Epidemiology Collaboration equation. Pulmonary arterial hypertension (PAH) was defined as pathological changes that predominantly affected the distal pulmonary arteries (<500 μm) with medial hypertrophy, intimal proliferative and fibrotic changes, adventitial thickening with mild-to-moderate perivascular inflammatory infiltrates and lymphoid neogenesis, complex lesions (plexiform and dilated lesions), and thrombotic lesions. Cardiogenic shock (CS) was defined as a state of critical end-organ hypoperfusion due to reduced cardiac output. Patients with type 2 diabetes mellitus were defined as individuals having fasting plasma glucose (FPG) ≥126 mg/dL and were fasting with no caloric intake for ≥8 h or HbA1c ≥6.5%. A patient with hypertension was defined as an elevated blood pressure of 140/90 mm Hg in individuals <60 years and elevated blood pressure of 150/90 mm Hg in individuals >60 years. Echocardiography was performed to measure Left Ventricular Ejection Fraction and the presence of Regional Wall Motion Abnormality in patients. The in-hospital outcomes (death and duration of hospital stay) were determined from the patient's hospital records. The patients were assessed through the telephonic interview for mortality outcomes. The normality of data for continuous variables was checked using Q–Q plots. Continuous variables were summarized as the mean ± standard deviation or median (IQR) and categorical data were expressed as frequency and percentages. The differences in the categorical variables between groups were evaluated using the Chi-square test. Parametric or nonparametric tests were used based on the distribution of data. The differences in continuous variables between groups were analyzed using the Mann–Whitney U-test or Independent Samples t-test. Kaplan–Meier method was performed using the Log-rank test. Cox proportional hazard model was used to determine the factors which increased risk of mortality among the study patients. All statistical analyses were performed using SPSS software version 16.0 (SPSS Inc., Chicago, IL, USA). All values were two-sided and a value of P < 0.05 was considered statistically significant. A total of 423 patients were identified according to the inclusion/exclusion criteria from January 1, 2013, to December 31, 2017. Among the 423 identified cases, 51 patients did not fit the inclusion/exclusion criteria and complete data were unavailable for 17 patients. Finally, a total of 355 study patients were included in the study with a mean age of 57.78 ± 12.78 years. The baseline characteristics of the study patients are illustrated in [Table 1]. Men and women represented 62.5% and 36.3% of the study population, with no significant difference in the age of the study population. The total leukocyte count (TLC) hemoglobin, packed cell volume, creatine phosphokinase (CPK) and creatine phosphokinase isoenzyme MB (CPK-Mb) was significantly higher among the male patients. However, there were no significant differences in the frequency of DM and hypertension between the two genders. The different etiologies for HF in the study population included ischemic heart disease (IHD), rheumatic heart disease (RHD), dilated cardiomyopathy (DCM), hypertrophic obstructive cardiomyopathy, restrictive cardiomyopathy (RCM), congenital heart disease (CHD), peripartum cardiomyopathy (PCM), primary electrical disease, infection and others. IHD (58%) and DCM (24.79%) represented the highest percentage of patients, whereas PCM (0.56%) and RCM (0.56%) represented the lowest percentage of patients [Figure 1]. The mean age of the study patients was significantly higher among the ischemic HF patients (60 years) than the nonischemic HF patients (54 years) (P = 0.002). As expected, the number of male patients was significantly higher among the ischemic HF patients than the nonischemic HF patients (142 (68.9) vs. 79 (53.7)) (P = 0.0001). Clinical features differed significantly among the groups. For instance, syncope and chest pain were more common among the ischemic HF patients; whereas leg swelling and palpitations were significantly higher among the nonischemic HF patients [Table 2]. The median length of the hospital (LOH) stay was 5 days for all hospital admissions. The median LOH stay was significantly higher among the nonischemic than the ischemic HF patients (5 [4–8] vs. 5 [2–8]). A total of 103 (29.01%), 20 (5.63%), and 17 (4.78%) had undergone coronary angiography (CAG), coronary artery bypass grafting (CABG), and percutaneous transluminal coronary angioplasty (PTCA)/percutaneous coronary intervention (PCI), respectively. The in-hospital and 2-year mortality was found to be 104 (29.3%) and 179 (50.4%), respectively. The in-hospital death was significantly higher in patients with ischemic HF (P = 0.0001). Among the in-hospital deaths, the cause of death was as follows: death due to pump failure or severe left ventricular dysfunction (35.36%), CS (51.92%), right ventricular failure or dysfunction (5.77%), arrhythmias (2.88%), free wall rupture (2.88%), and other causes (3.85%). The time to an event which was defined as the time to development of mortality, was shorter in patients with ischemic HF (P = 0.0001). Similarly, the 2-year mortality was significantly higher in ischemic HF than nonischemic HF (119 [57.8%] vs. 58 [39.5%], P = 0.003) [Table 3]. 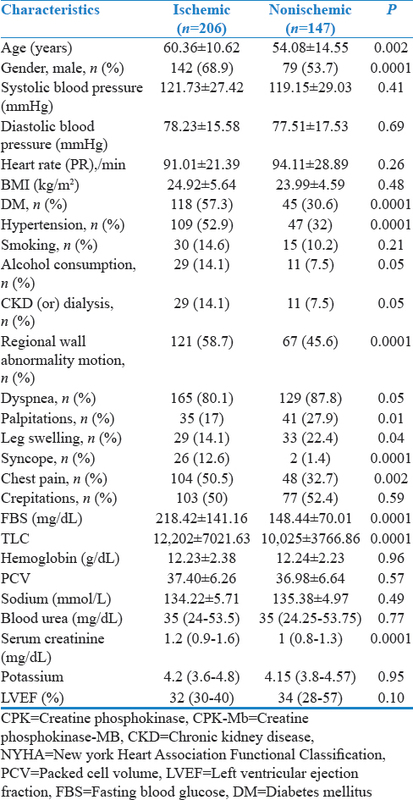 Certain factors such as the presence of dyspnea, leg swelling, crepitations, and CKD were associated with a longer duration of hospital stay [Table 4]. Kaplan–Maier survival curve was plotted for ischemic and nonischemic HF patients. 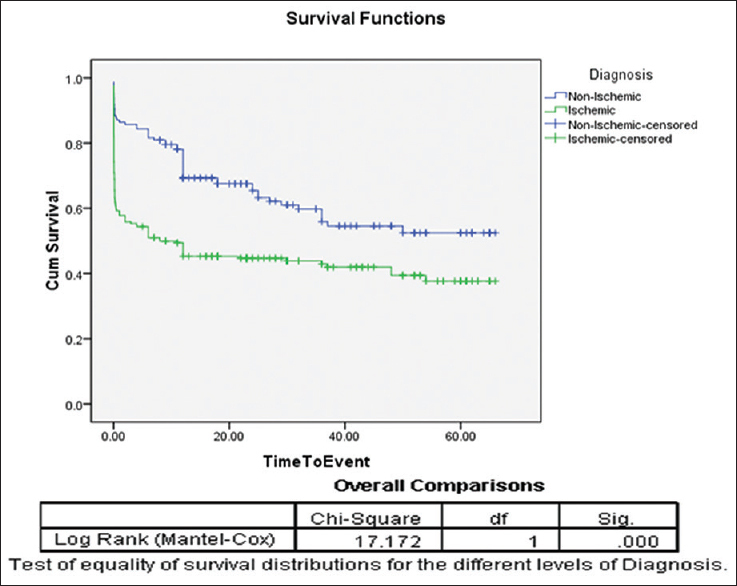 The Log-rank test showed a significant difference in the survival rate between the two groups (χ2 = 17.17, P = 0.0001) [Figure 2]. 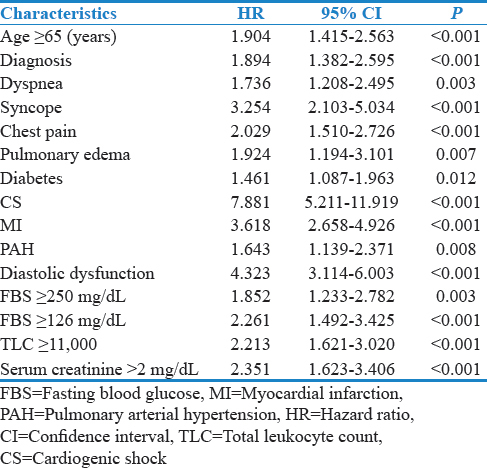 The univariate analysis Cox proportional hazard model showed that elderly age, diagnosis, the presence of dyspnea, syncope, chest pain, pulmonary edema, diabetes, cardiogenic shock, myocardial infarction, PAH, diastolic dysfunction and higher levels of FBS, TLC and serum creatinine were predictors of mortality [Table 5]. Furthermore, multivariate Cox proportional hazard analysis demonstrated that elderly age, the presence of diastolic dysfunction and higher levels of TLC were independent predictors of mortality [Table 6]. During the hospitalization period, almost 65.4%, 64.2%, 56.9%, 52.1%, 39.2%, and 24.2% received statins, loop Diuretics (LDs), trimetazidine, potassium-sparing diuretics (PSDs), beta-blockers and ACEis, respectively. 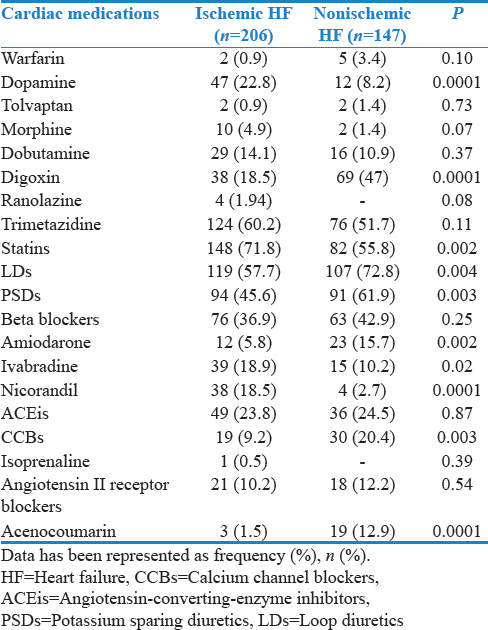 The usage of dopamine, statins, LDs, PSDs, ivabradine and nicorandil was significantly higher among the ischemic than the nonischemic HF patients. Acenocoumarin, calcium channel blockers (CCBs), amiodarone and digoxin were more common among the nonischemic HF patients [Table 7]. AHF continues to be a leading cause of mortality and morbidity worldwide. The data on HF is sparse in India and therefore, we conducted this retrospective cohort study to understand the epidemiology of HF in a representative sample and evaluated the factors which could increase the risk of mortality in HF patients. In the present study, the most common etiology of HF was found to be IHD (58%) which was followed by DCM (24.7%) and the least common etiologies were peripartum cardiomyopathy (0.6%) and RCM (0.6%), respectively. Consistent to our findings, the study performed by Harikrishnan et al., and Suman et al., showed that the most common HF etiologies were IHD (72% and 62.7%, respectively) which was followed by DCM., In another review performed by Pillai and Ganapathi, the frequency of IHD and DCM were higher among patients who were admitted for HF in a tertiary care hospital. 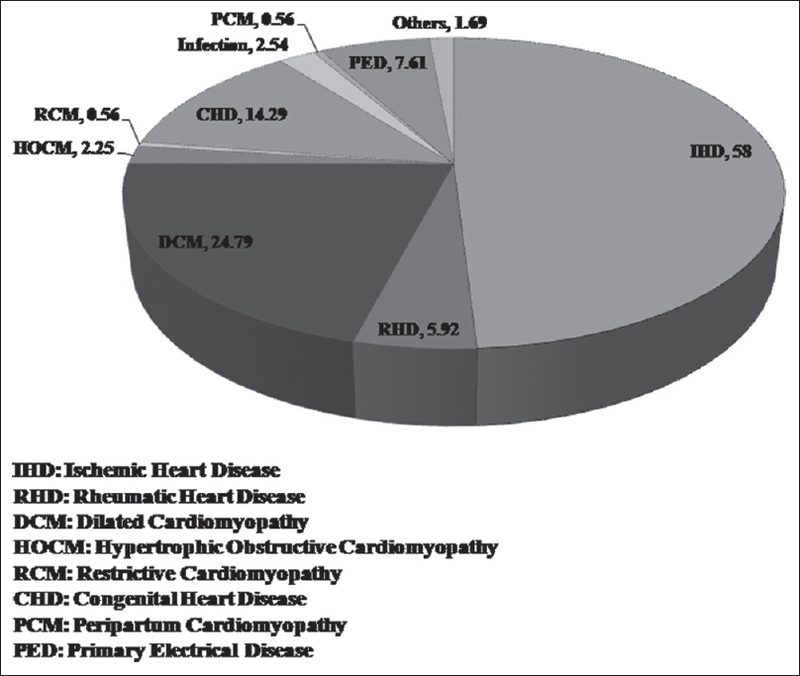 In the study performed by Dokainish et al., IHD was found to be the most common etiology in India (46%), whereas, in the study performed by Chaturvedi et al., in northern India RHD (51.96%) was found to be the most common etiology followed by IHD. However, studies have shown that there has been a decline in the rate of RHD across the country. The prevalence of RHD was found to be between 0.06% and 0.46% in the year 2008 compared to 1.52% in the year 1981. This decline in the rate of RHD might be due to improvement in the public hygiene and living standards of the society. The frequent usage of antibiotics for the treatment of throat infections could also be one of the reasons for the decline in RHD. It has also been observed that there has been a rapid decline in the number of RHD cases in Kerala and Tamil Nadu. The acute decompensated heart failure syndromes (ATTEND) registry demonstrated that the most common etiology was IHD (31.3%), whereas in the study performed by Lee et al., the most common etiology of HF was found to be CHD (52%). Therefore, the prevalence of etiology in the present study differs from the other international registries.,, Moreover, there has been a significant increase in the burden of IHD in India. As the prevalence of acute coronary syndrome (ACS) is on the rise, it is not surprising that the most common etiology of HF turns out to be of ischemic origin. Patients developing ACS are at a higher risk of developing HF in the future, and therefore therapies that target the structural changes in the heart following an acute coronary event could have a significant impact in reducing the incidence of hospital admissions due to ischemic HF. The occurrence of in-hospital mortality (40% vs. 13%) and 2-year mortality (57.8% vs. 39.5%) was significantly higher among the ischemic than the nonischemic HF patients. In a recent prospective study done at Trivandrum (n = 287), the in-hospital mortality and 2-year mortality was higher among the ischemic HF than the nonischemic HF patients ([28% vs. 9%] vs. [42.3% vs. 29.9%]), respectively. The 2-year mortality was almost similar to the present study; however, the in-hospital mortality was found to be higher in the present study. The retrospective study conducted by Thanusubramanian et al. showed that the in-hospital mortality was lower in patients with preserved systolic function (6%) than patients with left ventricular systolic dysfunction (20%). In the study performed by Matsuo et al., the mortality rates in the ischemic and nonischemic origins were found to be 21.8% and 22.6%, respectively. In the V-HeFT-I trial, at 2.3 years of follow-up the mortality rates in the ischemic and nonischemic groups were found to be 57% and 20%, respectively. The mortality rates in the present study seem to be higher due to the late presentation to the hospital after the occurrence of myocardial infarction. The majority of the patients visiting our tertiary care hospital are from a poor socioeconomic status and poor compliance to medications is not an uncommon problem in this population. Due to the nonavailability of health insurance most of the patients with ischemic HF did not opt for PCI and coronary artery bypass surgery (CABG). In addition, the presence of comorbidities such as diabetes, hypertension, and smoking could have influenced the mortality outcomes among the study patients. Hence, the mortality rate might have been higher in the present study when compared to the previous studies. The present study demonstrated variables such as the elderly age, presence of diastolic dysfunction and high levels of TLC as independent predictors of 2-year mortality. Consistent to our findings, the THFR (n = 1205) demonstrated that elderly aged population, lower education, poor ejection fraction, high serum creatinine, NYHA class IV, and suboptimal medical treatment were associated with a higher risk of 90-day mortality. However, in the present study the presence of diabetes and high serum creatinine levels failed to predict mortality independently. In our study, the mortality rate among the elderly (66%) was significantly higher than the nonelderly population (41%) (P = 0.0001). Likewise in a retrospective database study, performed in Germany similar results were observed where the mortality rate among the elderly (age ≥90 years) was 55.9% and among nonelderly (age ≤49 years) was 4%. The elderly population is likely to have a shorter life expectancy, poor compliance to the medications and may encounter some side-effects during and after the treatment period. In such patients, the presence of comorbidities may further accelerate the progression of disease which in turn leads to a higher percentage of mortality. In a population-based cohort study, diastolic dysfunction was associated with increase in the incidence of HF (Hazard Ratio [HR], 1.81 (95% confidence interval [CI], 1.01–3.48])). In an earlier longitudinal, prognostic, observational primary health care study with 10 years of follow-up significant associations were found for overall HF (HR, 1.86; 95% CI, 1.15–3.01), isolated systolic HF (HR, 1.95; 95% CI, 1.06–3.61), and combined (systolic and diastolic) HF (HR, 3.28; 95% CI, 1.74–6.14) with all-cause mortality. In another single-center study, it was demonstrated that patients presenting with moderate (HR, 1.58; 95% confidence interval, 1.20-2.08) and severe diastolic dysfunction (HR, 1.84; 95% CI 1.29–2.62) had an increased mortality risk (P < 0.001). Therefore, this clinical finding may have important clinical implications when there is a high prevalence of diastolic dysfunction among the population. In our study, the median LOH stay was found to be 5 days among the ischemic and nonischemic HF patients. Similar findings were seen in earlier studies performed by Harikrishnan et al., and Thanusubramanian et al., LOH stay is an important outcome to be studied in HF patients. We defined Longer LOH stay as the LOH stay greater than median, i.e., 5 days. The current findings showed that longer LOH stay was more common in the presence of dyspnea, leg swelling, crepitations, and chronic kidney disease. 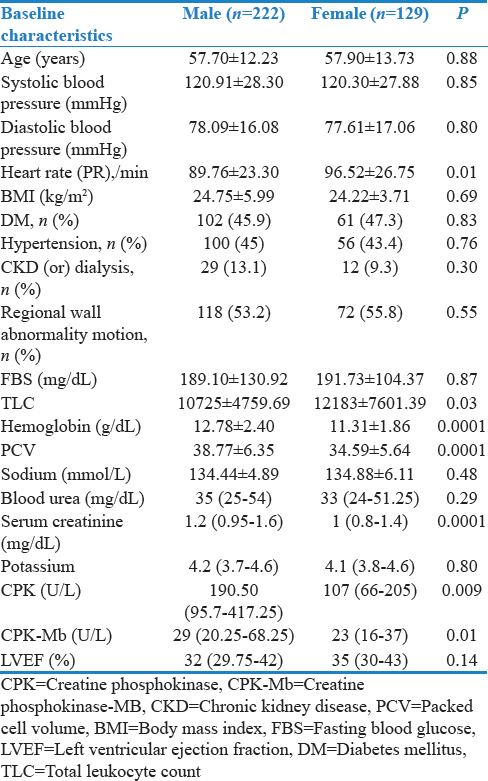 In a study performed by Wright et al., the presence of oedema at admission, change in the body weight, duration of treatment with iv diuretic, development of renal impairment, concurrent respiratory problems requiring specific treatment, and social problems were associated with longer than average LOH stay. The results from the Pre-RELAX-AHF study also demonstrated that persistence of dyspnea and worsening of HF prolonged the LOH stay. Studies have shown that presence of DM and hypertension will prolong the LOH stay., However, in our study, the median LOH stay was similar irrespective of the presence of DM, hypertension, change in body weight, and worsening of HF. In the present study, patients with chest pain, myocardial infarction, and CS had a shorter LOH stay since a considerable number of these patients had in-hospital mortality leading to a shortened LOH stay. The LOH stay in the present study was similar to the studies performed by Adams et al. and Abraham et al. 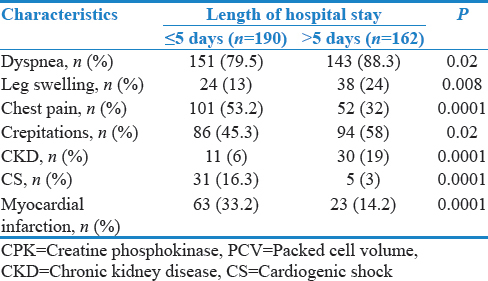 in developed countries, where the LOH stay were 4.3 days and 4 days, respectively., In the present study, statins, loop diuretics, trimetazidine, PSDs, beta-blockers, and ACEis were administered to most of the patients. We observed a similar pattern of pharmacological treatment in two of the earlier published studies., In our study, it was observed that higher percentage of ischemic HF patients received dopamine, statins, LDs, PSDs, ivabradine and nicorandil; and a higher percentage of nonischemic HF patients received acenocoumarin, CCBs, amiodarone and digoxin. In a recent systematic review and meta-analysis, a sub-optimal usage of evidence-based medications has been reported and therefore, it is highly essential to develop better strategies for HF surveillance and management in the LMICs. The present study was done in a single-center situated in a sub-urban region, making the findings of the study less generalizable across all populations in the country. Larger multi-centric studies across different ethnic background and diverse social strata would be more reflective of the pattern of AHF presentation and management in the country. During the follow-up period, a total of 41 patients were lost to follow-up which might have influenced the outcomes. Patients admitted in the hospital beyond 2016 could only be followed for <2 years until the time the manuscript was being written. Nevertheless, the overall median duration of the follow-up of the study population was 2 years. In summary, this study has shown that the 2-year mortality rate was higher among patients with ischemic HF than non-ischemic HF. Besides an ischemic etiology, the most common cause for HF included idiopathic DCM and rheumatic heart disease. Advanced age, elevated leukocyte count and diastolic dysfunction were independent predictors of 2-year mortality among survivors of acute HF. We would also like to thank the “Medical Records Department (MRD, SRM MCH and RC, Kattankulathur, Kancheepuram)” for providing assistance during the data collection. We would also like to thank Ms. M. Kamatchi, Mr. Sai Aravind and Ms. Varshitha Nakka for assisting us for the data collection. Denolin H, Kuhn H, Krayenbuehl HP, Loogen F, Reale A. The definition of heart failure. Eur Heart J 1983;4:445-8. Watson RD, Gibbs CR, Lip GY. ABC of heart failure. Clinical features and complications. BMJ 2000;320:236-9. Chaturvedi V, Parakh N, Seth S, Bhargava B, Ramakrishnan S, Roy A. Heart failure in India: The INDUS (INDia Ukieri Study) study. J Pract Cardiovascul Sci 2016;2:28-35. Lee DS, Gona P, Vasan RS, Larson MG, Benjamin EJ, Wang TJ, et al. Relation of disease pathogenesis and risk factors to heart failure with preserved or reduced ejection fraction: Insights from the Framingham heart study of the national heart, lung, and blood institute. Circulation 2009;119:3070-7. Writing Committee Members, ACC/AHA task force Members. 2016 ACC/AHA/HFSA focused update on new pharmacological therapy for heart failure: An update of the 2013 ACCF/AHA Guideline for the Management of Heart Failure: A Report of the American College of Cardiology/American Heart Association Task Force on Clinical Practice Guidelines and the Heart Failure Society of America. J Card Fail 2016;22:659-69. Parmar KR, Xiu PY, Chowdhury MR, Patel E, Cohen M. In-hospital treatment and outcomes of heart failure in specialist and non-specialist services: A retrospective cohort study in the elderly. Open Heart 2015;2:e000095. Dharmarajan K, Hsieh AF, Kulkarni VT, Lin Z, Ross JS, Horwitz LI, et al. Trajectories of risk after hospitalization for heart failure, acute myocardial infarction, or pneumonia: Retrospective cohort study. BMJ 2015;350:h411. Ponikowski P, Voors AA, Anker SD, Bueno H, Cleland JG, Coats AJ, et al. 2016 ESC guidelines for the diagnosis and treatment of acute and chronic heart failure: The task force for the diagnosis and treatment of acute and chronic heart failure of the European Society of Cardiology (ESC) Developed with the Special Contribution of the Heart Failure Association (HFA) of the ESC. Eur Heart J 2016;37:2129-200. Chapter 1: Definition and classification of CKD. Kidney Int Suppl (2011) 2013;3:19-62. Thiele H, Ohman EM, Desch S, Eitel I, de Waha S. Management of cardiogenic shock. Eur Heart J 2015;36:1223-30. American Diabetes Association. Standards of medical care in diabetes-2016 abridged for primary care providers. Clin Diabetes 2016;34:3-21. Kurmani S, Squire I. Acute heart failure: Definition, classification and epidemiology. Curr Heart Fail Rep 2017;14:385-92. Suman OS, Vijayaraghavan G, Muneer AR, Ramesh N, Harikrishnan S, Kalyagin AN. Long-term outcomes of patients admitted with heart failure in a tertiary care center in India. Indian Heart J 2018;70 Suppl 1:S85-9. Pillai HS, Ganapathi S. Heart failure in South Asia. Curr Cardiol Rev 2013;9:102-11. Dokainish H, Teo K, Zhu J, Roy A, AlHabib KF, ElSayed A, et al. Global mortality variations in patients with heart failure: Results from the international congestive heart failure (INTER-CHF) prospective cohort study. Lancet Glob Health 2017;5:e665-72. Ramakrishnan S, Kothari SS, Juneja R, Bhargava B, Saxena A, Bahl VK, et al. Prevalence of rheumatic heart disease: Has it declined in India? Natl Med J India 2009;22:72-4. Sato N, Kajimoto K, Keida T, Mizuno M, Minami Y, Yumino D, et al. Clinical features and outcome in hospitalized heart failure in Japan (from the ATTEND registry). Circ J 2013;77:944-51. Adams KF Jr., Fonarow GC, Emerman CL, LeJemtel TH, Costanzo MR, Abraham WT, et al. Characteristics and outcomes of patients hospitalized for heart failure in the United States: Rationale, design, and preliminary observations from the first 100,000 cases in the acute decompensated heart failure national registry (ADHERE). Am Heart J 2005;149:209-16. Youn YJ, Yoo BS, Lee JW, Kim JY, Han SW, Jeon ES, et al. Treatment performance measures affect clinical outcomes in patients with acute systolic heart failure: Report from the Korean Heart Failure Registry. Circ J 2012;76:1151-8. Palaniappan M. Factors predicting mortality in Indian patients hospitalized for acute decompensated heart failure. IOSR. J Dent Med Sci 2016;15:90-5. Greenberg BH, Abraham WT, Albert NM, Chiswell K, Clare R, Stough WG, et al. Influence of diabetes on characteristics and outcomes in patients hospitalized with heart failure: A report from the organized program to initiate lifesaving treatment in hospitalized patients with heart failure (OPTIMIZE-HF). Am Heart J 2007;154:277.e1-8. Chang HY, Wang CC, Wu YW, Chu PH, Wu CC, Hsu CH, et al. One-year outcomes of acute decompensated systolic heart failure in Taiwan: Lessons from TSOC-HFrEF registry. Acta Cardiol Sin 2017;33:127-38. Störk S, Handrock R, Jacob J, Walker J, Calado F, Lahoz R, et al. Epidemiology of heart failure in Germany: A retrospective database study. Clin Res Cardiol 2017;106:913-22. Pons F, Lupón J, Urrutia A, González B, Crespo E, Díez C, et al. Mortality and cause of death in patients with heart failure: Findings at a specialist multidisciplinary heart failure unit. Rev Esp Cardiol 2010;63:303-14. Thanusubramanian H, Kishore MK, Shetty R, Amberkar MB. A retrospective study of the treatment outcome of drug therapies used in heart failure patients with associated co-morbidities in a tertiary care hospital. J Clin Diagn Res 2016;10:FC06-9. Matsuo S, Nakajima K, Nakata T. Prognostic value of cardiac sympathetic nerve imaging using long-term follow-up data – Ischemic vs. non-ischemic heart failure etiology. Circ J 2016;80:435-41. Cohn JN, Archibald DG, Ziesche S, Franciosa JA, Harston WE, Tristani FE, et al. Effect of vasodilator therapy on mortality in chronic congestive heart failure. Results of a Veterans Administration Cooperative Study. N Engl J Med 1986;314:1547-52. Kane GC, Karon BL, Mahoney DW, Redfield MM, Roger VL, Burnett JC Jr., et al. Progression of left ventricular diastolic dysfunction and risk of heart failure. JAMA 2011;306:856-63. Olofsson M, Boman K. Impact on mortality of systolic and/or diastolic heart failure in the elderly 10 years of follow-up. J Clin Gerontol Geriatr 2015;6:20-6. Halley CM, Houghtaling PL, Khalil MK, Thomas JD, Jaber WA. Mortality rate in patients with diastolic dysfunction and normal systolic function. Arch Intern Med 2011;171:1082-7. Metra M, Teerlink JR, Felker GM, Greenberg BH, Filippatos G, Ponikowski P, et al. Dyspnoea and worsening heart failure in patients with acute heart failure: Results from the Pre-RELAX-AHF study. Eur J Heart Fail 2010;12:1130-9. Peacock F, Amin A, Granger CB, Pollack CV Jr., Levy P, Nowak R, et al. Hypertensive heart failure: Patient characteristics, treatment, and outcomes. Am J Emerg Med 2011;29:855-62. Abraham WT, Fonarow GC, Albert NM, Stough WG, Gheorghiade M, Greenberg BH, et al. Predictors of in-hospital mortality in patients hospitalized for heart failure: Insights from the organized program to initiate lifesaving treatment in hospitalized patients with heart failure (OPTIMIZE-HF). J Am Coll Cardiol 2008;52:347-56.